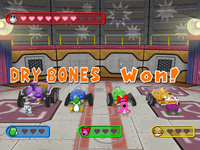 Think Tank is a 1 vs. 3 minigame that is found in Mario Party 7. The name is a pun on think tanks, organizations that conducts research and advocacy, and military tanks. One player controls a large, slow tank while the rest have small, fast ones. The large tank has ten hit points while the smaller ones have three. The goal of the three small tanks to defeat the large tank, while the large one's goal is to destroy the small ones. All players stand in front of their tanks. Any eliminated tank appears wrecked and has smoke coming out of it. The winner(s) do(es) their victory pose. Rules – "One player drives a big tank while the other 3 team up in smaller tanks. Last team standing is the winner!" Advice – "The players in small tanks must work together, or the big tank will crush them!" This page was last edited on November 26, 2017, at 20:14.